Since the middle of this year, enterprises have been a key adopter of the team chat app. Often introduced in a company by a particular team wanting to work on their own collaborative project, the app tends to get noticed quickly by other colleagues and filters through an organization. Commenters have noted that the app’s ease of adoption and allowance for autonomous use by business teams has been the entry leverage point that precedes more widespread adoption, a route software is often unable to follow to gain uptake in a corporate environment where SaaS products are usually bought in a more centralized manner. 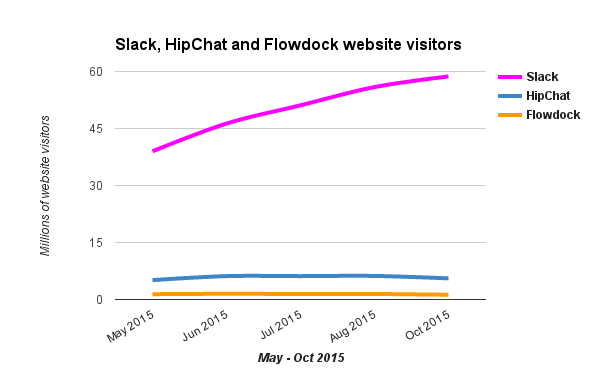 Slack was created in 2013, and had an estimated 8,000 signups on its first day. The idea of the app was to enable team communication by providing chat rooms, organized by themes, as well as offer private messaging and private group messages. The app — created by the team behind Flickr — was particularly adopted by developer teams and startups, mirroring the app’s original use case: it had been created as an internal tool for developers of an online game so they could communicate on their builds. Since then, it has seen a fairly constant growth rate. In the past six months, website statistics site SimilarWeb, for example, has estimated visitors to the Slack website have grown from just under 40 million to just under 60 million. This figure is calculated for website visitors and reflects levels of engagement with the web app, not the number of actual customers, which Fortune reported at 1.1 million in the middle of the year. As a mobile app, App Annie reports that in the iTunes App Store, the Slack app is ranked first in the business category in 12 countries, and in the top ten business apps in 101 countries. Amongst developers tracking the Slack API, API Changelog reports that it is one of the most followed APIs in their catalog and growing each month, with 171 developers currently monitoring the Slack API. Slack is now seeing an ecosystem emerge around it that is enabling other businesses to springboard off the Slack phenomenon. Convergely, for example, has built itself around offering productivity tools that surface from Slack chats. Last month, Startup investor at PointNineCap, Rodrigo Martinez, posits that there are some greenfield opportunities in building a business on top of messaging, and singles out Slack as being “an open platform in the corporate environment” because of its user adoption, integration mindset and core base of developers as customers. Martinez links to a ProductHunt list showing some of the bots, tools and ecosystem businesses already being created on top of Slack. Services like SlackStack have sprung up to facilitate the discovery of Slack tools. Meanwhile, Bloomberg recently noted that Slack has been hiring compliance and policy staff to help position the app company for an enterprise plan that can address needs of particular verticals like finance. As that comes to fruition, more players will seek to build their own business products on top of Slack’s new ‘spine’ in a way we have seen with Docker partners and ecosystem products. At the recent API Days London, Nicolas Debock, an investor at Balderton Capital, said that he is expecting to see a series of Slackbot funding proposals in their next round of funding. This emerging Slack ecosystem growth goes beyond integrations — although there are those too — and shows how central Slack is becoming to the developer workflow for now, but how it could be set to transform the whole business process software market. Underwood said that a lot of dev teams that are building software are using it throughout their product development processes, and that in turn is helping them generate new ideas about how to offer Slack-based products and integrations to end users. “We have had significant demand from developers early on in our platform,” said Underwood. LaunchKit is a prime example of how Slack is both inspiring new ideas for dev tools and then being used as a way to leverage an end product’s entry into the market. LaunchKit is a suite of tools built for product managers and app dev teams aimed at helping devs market apps in app stores, monitor app store reviews, manage app sales, and build websites for apps. With positive reaction strong, Mulligan’s team began to invest in creating the new suite of tools. One of the first was Review Monitor that pushes summaries of reviews to Slack so that the whole dev team gets a sense of how an app is being perceived by end users. The idea for the tool came from using Slack, said Mulligan. Slack integrations are blooming out from an initial developer use base within the enterprise and extending into other roles. That’s why Blockspring has focused on Slack with it’s second key tooling after spreadsheets. Blockspring is a service that wraps APIs into existing tooling like spreadsheets so that non-technical users can make use of the underlying power of APIs. Recently, they have been working on an integration so that from within Slack, users can identify what APIs may help them get the data they need or can outsource particular functions via API. “We focus on whichever tools businesses want to use. We believe business becomes better when you have access to APIs. We also use Slack internally a lot and we saw the potential immediately. Slack is built into the behavior of the user: they use event-driven integrations that come into the tool. That is a little different than going out to a web service, so we thought that would be really cool to integrate there,” said Paul Katsen, CEO of Blockspring. The goal for Blockspring then has been to bring their service in front of users in their workflow, and today that means being accessible within Slack. One of Slack’s key benefits is that it helps center work relations around connection and communication beyond a task or document. Speaking with the Financial Times, Slack Cofounder Stewart Butterfield said this is integral to what sets the app apart from other team-based cloud software like Dropbox, who center the interaction around a document and are therefore “probably just wrong”. And while other team-based software has attempted to create a newsfeed-like feature that updates business colleagues about what recent interactions have occurred and what tasks have been accomplished, Slack is able to do this at a higher, cross-business scale. With a J-curve of integrations being created by apps to enable Slack notifications from their services, Slack is offering a single, global update within the business setting: alerts from customer service software, online shop-carts, IT monitoring, and order fulfillment all in the one flow. The Financial Times said this makes Slack “a digital spine for a business,” drawing in both human and machine-generated data. It is this potential that may see Slack morph from being solely a workchat and collaboration tool to being a new type of business process management platform. But to get there, developers creating integrations need to think through what information is useful in a notification that can help end users wherever they are in their process. It also means Slack has to aid discovery of integrations that can help businesses get their jobs done without taking them out of their workflow. “The problem we are now trying to solve is: there are already great applications built on our API that people can’t find,” said Underwood. “We make it easy for devs to create great experiences on Slack, but we need to make sure business and enterprise teams can find those integrations and make use of them. “We need to make it easier for teams to find the integrations they need. It is our job to help teams work more effectively. We will have to do something smarter to help teams find the integrations for them. We have a lot of work to do. If Slack is to become more a complete business process tool — a spine of command center — Slack will need to enable discoverability capabilities in the same way that Blockspring is seeking to do by enabling APIs to surface from within a Slack channel. But to realize the command center vision will also require developers to build the sorts of rich experiences that mean end users can rely on using Slack as a central hub for their workflows. The next six months will be key for Slack. They are currently at a stage where if they don’t solve the integration discoverability issue, users will limit their expectations of the platform so it remains solely a workchat tool. At the same time, as integration partners expand, those partners need to be savvy enough that they are offering valuable notification experiences to Slack’s end users rather than just seeking to ride the Slack wave with fast and clumsy integrations. And all this is occurring while Slack chases the enterprise market. With its rapid uptake, Slack is in the early days of morphing now into being more than just a messaging app for teams. This is where the ecosystem has the opportunity to expand beyond just integrations that work well with Slack and that instead lead to the creation of products — like LaunchKit that can stand alone, but make more sense as components that link into Slack to deliver their information. Along with this outcrop of new products will be a growing ecosystem platform that existing services will want to link into, in the way that Runscope are positioning their availability to Slack users. And finally, there is the issue of discoverability, which has the opportunity to profoundly change the expectations enterprises have for business process tools, where a degree of automation can help users identify what functionalities or data exist without already needing to know what is out there. Slack might just be what business process software and API aggregation workflow tools look like in the future. 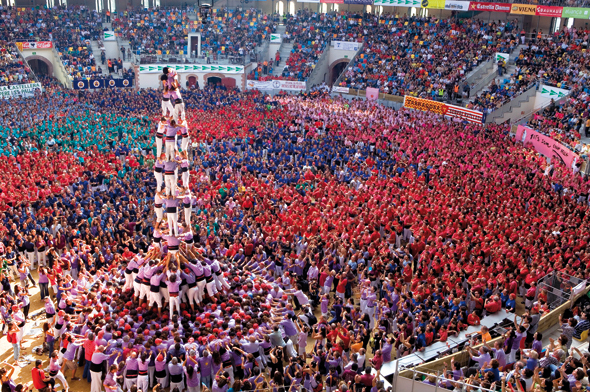 Feature image: “7.- Castells i castellers. Patrimoni Immaterial de la Humanitat” by Palau Robert, Generalitat de Catalunya, licensed under CC BY -ND 2.0.